Sat at the RAIN Summit 2017 at The British Museum in London (Radio and Internet News Summit). One of the main keynotes of the morning is a panel on podcasting, with some leaders in the UKpodcast industry. It’s fantastic that podcasting holds this kind of position in the radio industry this year, where previously it was considered as a catch up service of UK radio shows for so long. The panel discussed various questions around podcasting… From growth, to content, and why networks hadn’t made it as big as they have in the US. The discussion that captured my ear the most though was. ‘Why podcasting stats aren’t where they need to be and we don’t know enough about how many people are listening’ …. In honesty… the debate drove me insane!! When we run a social media campaign, some people look at likes on a post as success… who cares?! It’s about the engagement, we want to know who took the time to comment and who actually converted. Who took part in the activity we wanted them to as a result of the social post? Podcasting should be looked at in the same way! When we learnt our trade in commercial Radio as presenters we were told, think just of one person and address them. Why should looking at podcasting statistics be any different?!? If we look at a show with 10,000 listens but only 5 people click through to the producer or advertisers website… And compare it to a show with 250 listeners that gets 20 people click through to the website.. which is more successful? And which statistic actually matters? At the conference we heard from a company that were able to service audio adverts to people who were in the vicinity of a mobile phone store… in order to convert them and get them into the store. The statistics talked about were not how many people listened or how many people were serviced the advert, but focussed on how many people were brought into store from the ad… which is what the client wanted! This should be the focus of podcast statistics. Maybe if we re-frame the thought process. If you get 10,000 listeners but only 10 conversions to website or product… maybe we’ve failed to engage 9,990 listeners… maybe something we shouldn’t celebrate. 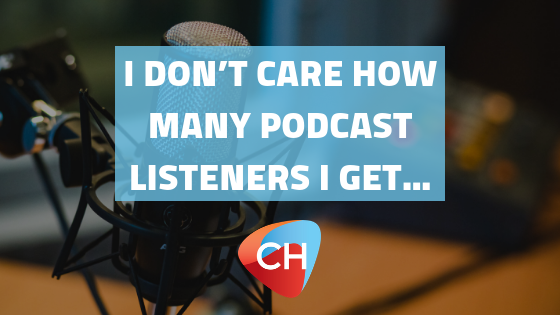 I feel passionately about the subject, and that’s because I truly DON’T CARE HOW MANY LISTENS MY PODCAST GETS… I care about how many people engage with the content! If you run into any trouble or need any more help with getting set up… Please do drop us a message in our Podcast Forum on Facebook. Go to http://Podtips.Net to be directed to the group. You know, I was last minute asked to be at that event and my schedule just didn’t line up. Now I’m gutted. I own a podcast stats company and I an 100% WITH you! Podcasting started with people, and it’s the people’s medium – one-to-one relations are at the core of it. Cheers Mark, great quote: Podcasting started with people, and it’s the people’s medium! Hit canva with that for social haha. Shame you couldn’t come down to the summit, hope to catch you soon! I understand the point but I still care greatly about the number of listens I get. It’s a great motivator to know that x000 people listen to my efforts and if the numbers keep rising then even better. I’m not selling anything so engagement isn’t important although every bit of positive feedback is like a rare and precious gem that I cherish and motivates me enormously. Ok, in saying just that I guess I’m agreeing with the writer because feedback IS engagement isn’t it?! Yep, just when the new stats set up knocks you for six, you get someone in another part of the world saying how much they’ve enjoyed your work. So, onwards and upwards chaps (and chapesses!). Thanks Paul, I completely agree that feedback gives a great feeling. It’s what we podcast for 🙂 If you aren’t selling or getting anyone to do anything with your pod, I can see your point too 🙂 Thanks for taking the time to read and comment! Thanks for sharing this angle.